I have three of these gorgeous and iconic posters. They look fantastic framed up and on display. The posters have crisp, clear colours and are printed on heavy white paper. They show signs of wear around the edges but the central images are all in good condition. They have been stored rolled in a tube which has protected the image and means no creases. They will flatten out under the glass in a frame. Overall size is 50cm x 40cm. Image size 30cm x 42cm. 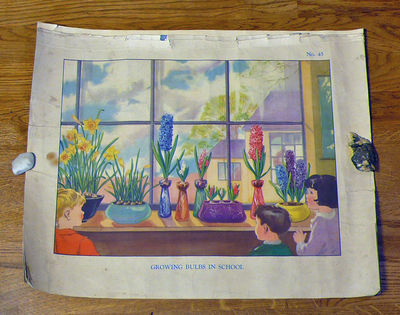 This one is entitled "Growing Bulbs in School" and is numbered 45 from a series. The outer edges of this print are more battered than the other two posters in the series and do have some marks. However the picture itself is in good condition as you can see. Sent rolled in cardboard tube.